Back in February I let you know about NewSearch 4 being available for purchase. At that point I told you that you would soon be able to order it from the New Church Online Store. There was a bit of a delay but you can now buy NewSearch 4 from the online store. In that post I also promised to post a full review of NewSearch 4. That may or may not happen. I also promised to explain how I got it working on my Mac. I'm pretty sure I'll do that. For now I wanted to let you know about the NewSearch Support page (www.newsearchsupport.net). It's pretty basic but it does the trick. There is a description of a bug and how to get around it; there's a form where you can submit a description of the problem you're having with either the desktop or online version of NewSearch; and there's a known issues page where you can find instructions about how to get NewSearch to install on Windows 7 and how to make it work on the 64-Bit version of Windows 7. I also want to tell you about a couple of things that I've learned about the online version of NewSearch 4, HeavenlyDoctrines.org. There are extensive instructions on the search page but, if you're like me, you've only scanned through them briefly and assumed that you'd be able to figure it out. My main piece of advice is, if you're interested in doing more detailed and powerful searches, read the instructions; and, if you're just interested in doing basic searches, pay attention to the drop-down menu (see my beautiful screenshot). 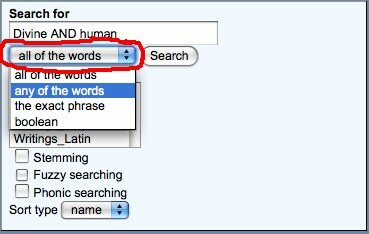 I assumed that if I wanted to search for Divine and Human I could just put Divine AND Human in the search box and hit Enter. But, if the drop-down menu is on the default ("all of the words"), then I'll get results containing Divine, and, and Human. If I want to use boolean operators like AND and OR, then I need to select "boolean". People have been looking for the ability to jump directly to a specific passage for a while. Chuck Ebert, who's in charge of the NewSearch project, has said that that's on their list of features to add to the online version. In the meanwhile he's put up instructions about how jump directly to a passage using the search box. Set the drop-down menu to "the exact phrase" and put the passage and number in using this format: Brief Exposition * n. 27. Yes the * needs to be there, unless you're searching for a book in Latin. I've discovered that it also works if you use abbreviations for the book titles—e.g. be * n. 27. I asked Chuck if it would be possible for him to make a similar feature for searching within just one book. He told me that he'd work on it later this week. So hopefully I'll be updating this post in a couple of days with instructions about how to do that. As a final tip I should let you know that all of the things that I've mentioned are explained on the HeavenlyDoctrines.org homepage (heavenlydoctrines.org). If you're like me, you have the actual search page (heavenlydoctrines.org/dtSearch.html) bookmarked and so never see the homepage. It might be worth checking the homepage periodically to see if they've added any other new features. Chuck has added a feature to search only within a certain book. Set the drop-down menu to "all of the words" and put what you want to search in this format: "brief exposition n. " regeneration. That will search for regeneration in just Brief Exposition. You do need the quotation marks and you do need the space after the n. and you do need the full title of the book. It's not perfect. If you search for regeneration in Brief Exposition using this method, it also gives you a result from Conjugial Love that cites a passage in Brief Exposition. But that may be useful in your research as well. I've also discovered that you can imperfectly but usefully search within just one translation of a work by adding the translator's name to the end of your search—e.g. if you search for "True Christian Religion n. " regeneration rose it will mostly give you passages in Jonathan Rose's translation of True Christian Religion that mention regeneration. It will also give you a couple of other passages that happen to include the words true, christian, religion, regeneration, and rose. Anyway, try it out and if you think of other features that you'd like or other ideas about how to improve the website go to www.newsearchsupport.net and submit a request. I just updated this post with details about another new feature that Chuck just added.